There's a lot of research that goes into buying a new car. You'll want to factor in details like the car's fuel efficiency, cost of car insurance, safety features, and how well it holds its value before buying. You'll also want to ensure that it meets your physical and driving needs and one of the best ways to do this is with a test drive. Taking a car out for a test drive is an integral part of the car buying process. Yet, it's estimated that about 16 percent of car buyers skip the test drive, and 33 percent test drive just one vehicle. For a purchase that easily costs $20,000 or more, forgoing the test drive could end up costing you in the long run. Minimize the chance of having buyer's remorse. Go on a test drive and get the most out of it with these easy test drive tips. A test drive will help you determine if the car is the right fit for you and your family's driving needs. Visibility: Make note of the view you're given of the road in front of you, out back, and by using the rear and side mirrors. How big is the blind spot? Also, make sure during the test drive you have an opportunity to back up the car so you can see if your sight lines are sufficient or if there's anything impeding it. Acceleration: How does the vehicle feel when you accelerate from a full stop, as well as when merging onto the highway? Make sure the way the car accelerates meets your needs. Braking. The vehicle's brakes should feel responsive and smooth. Test out the brakes in a couple of ways; smoothly and softly like you would during a typical drive and also harder, with more force, as if you needed to suddenly stop. 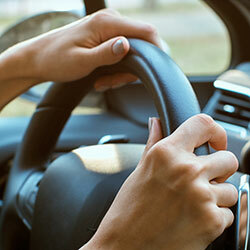 Steering and handling: Pay attention to the vehicle's steering and handling. It should be easy to manoeuvre the car while on the road, changing lanes and while taking corners. Ultimately, the car should respond to your commands with ease. Noise level: Some cars are simply noisier than others whether it's due to the engine or type of tire. Turn off the radio and close the windows and listen. Is the sound put out by the car acceptable? Comfort: Make sure that the vehicle is spacious enough (including legroom and headroom) and easy to get in and out of. How comfortable are the seats, not just in the front for the driver, but all passengers? Bring a couple of people out with you for the test drive so that they can give you their take on the passenger's comfort level. Dashboard controls: Whether it's the heating and cooling system, the speedometer, the gas gauge or the radio, the instruments and controls on the dashboard should be easy to see and reach. If possible, schedule more than one test drive; do one during the daylight and another in the evening when it's darker as this will give you a better, fuller, appreciation of the car. Also, if you're looking at more than one vehicle try to schedule your test drives so that there is little time between the two. That way, you'll be able to compare the qualities (or deficiencies) while each is still fresh in your mind. Now it's time to pass the insurance test! The vehicle may have passed the test drive, but now it's time to see if it passes the insurance test. Buy your new car with confidence. Take it out for a test drive and compare auto insurance rates too, because year-after-year, for the lifetime that you own the car, you'll need car insurance and you'll want to factor this cost into your buying decision as well.